Where do many West Africans go for an extended holiday or weekend fun? Chances are better than average that Togo tops many of their agendas. While we were living in West Africa, my family and I will never forget the Togolese hospitality we enjoyed during our visits to that friendly country. Some say, should a popularity contest be held today, amongst all West African countries, Togo-"Pearl of West Africa" would come first. Lome, the capital city, with several five star hotels and acres of sandy, sun-drenched beaches, has become a highly popular vacation center for Europeans. For most Americans and Canadians, it's still a well kept secret. Visitors hardly need to leave their hotel area; the Atlantic ocean is one block from the heart of the city. ...Map of Togo. Haven la Chance Desert Hotel is located 4 kilometres from Merzouga in the Oasis village of Hassilabied. It has 10 Modern Bedrooms with 7 rooms with showers and toilets en suite and a Berber Restaurant serves healthy local Berber food. Luxury on Rovos Rail . Page describes a tour by train from Cape Town, South Africa to Pretoria, with stops at famous sites including the world diamond capital of Kimberley. If you enjoy the delights of dining, each Togolese district has its own culinary specialties. One of my favorites is 'sauce des legumes' (vegetable sauce), with crab and foutou (mashed yams). Or how about something completely different? Try snails cooked like a brochette, or sit down to a dinner of smoked goat meat. Many visitors top off their meal with a glass of 'vin du palme' (palm wine), a popular, clear-colored drink that will knock your socks off. A big surprise on my first visit to Togo was 'Chateau Viale,' an astonishing, medieval style stone fortress. Perched high on a hill, this African castle was created by a visionary Frenchman in 1944 as a retreat for his wife. For some reason unknown to me -- she spent three days in palatial grandeur, then split for France. Today, Chateau Viale serves as the Togolese President's weekend retreat. For a change of venue, make a trip to Aneho, where you will experience life in a typical Togolese fishing village. You'll see fisher folk on the beach, hauling in their long nets, accompanied by an enchanting rhythm and singing. It's like an epic Hollywood movie scene. French is the official language of Togo, which has a population of 5 million. The two largest ethnic groups are the Ewe and the Kabye. Ewe consider the birth of twins a great blessing, while the Bassari consider twins a misfortune.This same contrast is seen in their eating habits; the Ewe eat cats, and consider anyone who eats dog meat to be barbarians. The Kabye enjoy dog meat, but refuse to eat cats. Voodoo and fetish cults: While in Haiti (1997) as part of a media video production team, comprised of Africa Travel Magazine, National Geographic and Radio Lumiere, I advised my colleagues on how Voodoo culture came to the Caribbean from Togo and other parts of West Africa. While in Togo, we spent a full day at Akodessewas, the world's largest fetish market, with its array of sorcerers' potions; roots, bark, monkey skulls, wart hog teeth, porcupine skins, leopard hides, antelope horns, bones of crocodiles, horses, pigs and monkeys, plus various parts of human anatomy. Such concoctions are used to cure everything from diarrhea and the flu, to cuts, impotence and rheumatism. I tried on a gris gris (necklace), which is said to work its magic when blessed by a fetish priest. Part doctor, part psychic, the priest relies on herbal medicines, charms and a healthy dose of positive thinking. They believe that the spirits are everywhere -- in the air, the trees, the water - even buildings. A priest calls on his favorite god to predict future events, and keep evil forces at bay. He sits on a stool in his colorful robe, holding a regal staff, receiving gifts of gin, which he sips as a troupe performs ritual chanting and dancing. A sacrificial offering is made as a show of loyalty and respect to the spirits, and to gain special favors, such as the birth of twins. 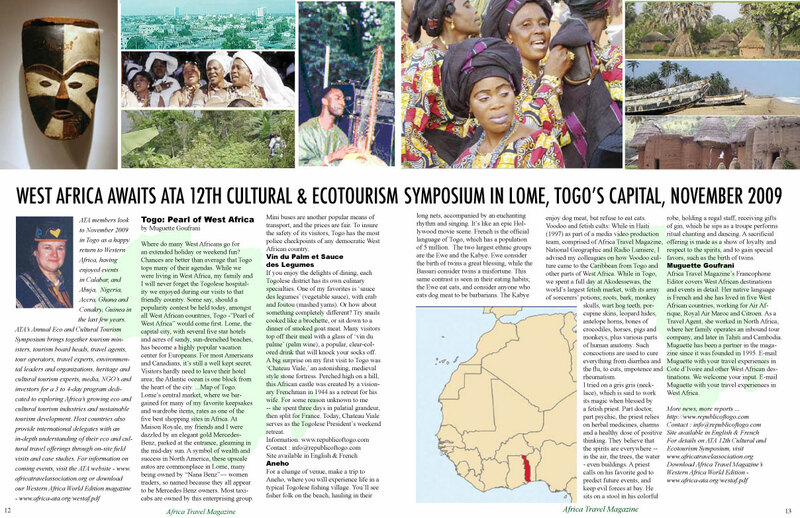 Muguette Goufrani, Africa Travel Magazine's Francophone Editor covers West African destinations and events in detail. Her native language is French and she has lived in five West African countries, working for Air Afrique, Royal Air Maroc and Citroen. As a Travel Agent, she worked in North Africa, where her family operates an inbound tour company, and later in Tahiti and Cambodia. Muguette has been a partner in the magazine since it was founded in 1995. E-mail Muguette with your travel experiences in Cote d'Ivoire and other West African destinations. We welcome your input. E-mail Muguette with your travel experiences in West Africa.